Wat is dit voor site? Wij zoeken de goedkoopste boeken op internet. Friends Are Everythingvonden we het goedkoopst op Bol.com voor €13.99. We hebben gezocht in nieuwe en tweedehands boeken. Rechtsonderaan de pagina kan je het boek direct bestellen	via Bol	.com. We're forced to ''put up'' with family. But we get to choose our friends. And when we do, we reap rich benefits and opportunities for growth. 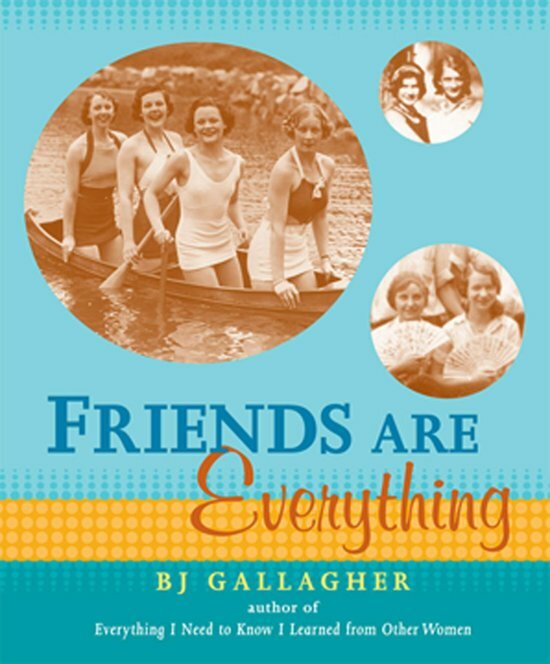 Friends figured large in BJ Gallagher's bestselling Everything I Need To Know I Learned From Other Women so she decided to delve into what it really means to have a true friend and what it means to be one. No friend is left unturned in this collection--neighbors, best friends, spiritual friends, friends who are family, friends who are lovers, friends at work, friends who help make each other's lives better in dozens of ways. BJ Gallagher's call for stories went out far and wide, and the stories came back--about friendships old and new, friends who tell you the truth you might not want to hear, who don't place conditions on their love, who help you see your best self, who forgive you when you hurt them, who respect your boundaries. Friends Are Everything is a heartfelt celebration of friendships and a perfect gift to share with a friend as a ''Thank you,'' an ''I'm sorry,'' or an ''I can't tell you how much you mean to me'' message. After all, there are some things you can only learn from your friends. Who else is going to let you know your slacking off is showing, let you show your true feelings, and leave you a message on your voice mail that makes you laugh so hard you're running to the loo? !